It began with a trip to a Big East Mental Health Summit and from there, two student athletes at Marquette started a special program: Student Health Allies and Peer Educators (SHAPE), focusing on raising awareness of mental health issues with student athletes. "We're just trying to point people in the right direction if they're in crisis or feel like they need to talk to someone," said Alex Gambacorta, Marquette lacrosse player. Learn more about the SHAPE program in a story by Kaitlin Sharkey, Fox 6 Milwaukee. Marquette's new 293,000-square-foot residence hall continues to take shape. The $108 million dormitory, named Robert A. Wild, S.J., Commons after the school's former president, is in its final months of construction and will house around 900 students once it opens for the 2018-19 academic year. It's located on the campus' northern end. Click through the Milwaukee Business Journal slideshow to see the progress on the new facility, which is located at North 17th and West Wells streets. David Dupee, Law ’09, decided to take a risk. After he graduated from Marquette Law School, he and two entrepreneurial friends decided not just to put down roots in Milwaukee, but to double down and open a business. After four pilot batches of an IPA recipe, it was time to make their move. They invested in a vacant 11,000-square-foot building on the city’s East Side and opened Good City Brewing. Read the full story from Marquette Magazine. "The good of a Jesuit education is that it moves us to engage in [the suffering of this world]. To become critically active citizens. To be agents of positive social change. The greatest lesson I’ve learned at Marquette is that God’s universe is a moral one, and it bends towards justice." Read and watch Zellmer's full Commencement address. On May 2, members of the Catholic, Jewish and Muslim faiths attended an interreligious forum at Marquette. Co-sponsored by the Klingler College of Arts and Sciences and CM CARES™, the Church Mutual Insurance Company Foundation, the forum featured presentations and a panel with prominent speakers of each faith. Monday, June 4, marked a celebratory milestone at Marquette University’s Dr. E.J. O’Brien Jesuit Residence. A construction team installed a 64-square-foot stained glass window in the Donald J. Schneider Chapel, putting the finishing touches on the three-year-old home of the Jesuits living on campus. View photos of the installation of the Jesuit Residence stained glass window. How much should we trust our new social robots? Robots are coming to our homes, ready to be our household assistants and companions. Dr. Despoina Perouli is studying them so we don’t give away our privacy and security when we let them in. A cyber security expert, Perouli was hired at Marquette in part to help open and run its growing Center for Cyber Security Awareness and Cyber Defense. It represents one big piece of the university’s move to establish itself as a national leader in the growing field of data sciences. The university wants to be ahead of the curve not only in researching what’s-now technology, but also what’s next. And for Perouli, market indicators clearly point to our world — at home, work and in public — going robotic. Read the full story from Marquette's 2018 Discover Research magazine. Students with autism spectrum disorders can have particular challenges in a college environment, away from the safety net of relatives and friends. Amy Van Hecke, Marquette professor and researcher who specializes in autism spectrum disorders, is behind an innovative program called “On Your Marq,” which will serve 8-10 students in its first year. Read the full story from WUWM 89.7 Milwaukee's NPR. On June 2, members of the MU Club of Northern California, along with family and friends, worked to prepare more than 700 meals for the homeless and those in need in the San Francisco area. These men and women for others gathered at Glide Memorial Church and donned hairnets, aprons and Marquette spirit wear to pack bag lunches. Next up for the club is a Giants vs. Brewers baseball outing on July 28. Follow the MU Club of Northern California on Facebook and Twitter. After a day on the links at Persimmon Woods Golf Club in Weldon Spring, Mo., MU Club of St. Louis alumni, families and friends were treated to a dinner and interviews with special guest Steve Wojciechowski, head coach, and Stan Johnson, assistant coach, Marquette Men's Basketball, plus an exciting round of bidding on live auction items. Watch the video stream of Stan and Wojo's interviews at the golf outing, and follow the MU Club of St. Louis on Facebook and Twitter. See a complete list of upcoming alumni events. Join Marquette alumni, parents, students and friends on Father's Day weekend for a picnic at Hains Point. We’ll have lawn games for friendly competition along with brats and burgers for fuel. Head to the ballpark with the Marquette LGBT+ Alumni Council and the Milwaukee Gay Sports Network for the first Milwaukee Brewers Pride Night. Join fans at Miller Park for the Brewers vs. Cardinals game. Network with Marquette alumni, parents and friends. Hear from nationally recognized industry expert, Dr. Douglas Fisher, assistant professor of supply chain management and director of the Center for Supply Chain Management, College of Business Administration at Marquette University. Arrive at the world's largest music festival -- Summerfest -- between noon and 3 p.m. wearing a shirt or hat representing Marquette and receive free admission. Watch alumni teams from Marquette, Georgetown, Seton Hall and St. John’s as they face off at Marquette University’s Al McGuire Center on June 30 and July 1, with the winner advancing to TBT’s Super 16. Join the MU Club of Washington, D.C., in the spirit of St. Ignatius in service to others through volunteering at the Father McKenna Center, helping with the center's meal program and hygiene product distribution. Join Marquette Athletics at this annual summer celebration. Enjoy delicious food, children’s games and interactive activities hosted by student-athletes and coaches from each of the varsity teams. The M Club Hall of Fame honors former Marquette student-athletes for excellence on and off the field of play. Selection to the M Club Hall of Fame is the highest honor for a Marquette athlete. Mix with current alumni and welcome new grads and summer interns to New York. Don’t miss this annual tradition at the West 79th Street Boat Basin. CELEBRATING UNDERGRADUATE CLASSES ENDING IN "3" AND "8"
Damien Jaques, Arts’ 68, was inducted into the Milwaukee Media Hall of Fame. He has spent 44 years in the media at the Milwaukee Journal, Milwaukee Journal Sentinel, Wisconsin Public Radio and OnMilwaukee.com. He lives in Sarasota, Fla.
Paulina Bermeo Mejborn, Eng ’14, and Kristoffer Bermeo Mejborn were married on Nov. 11, 2017, in Cuenca, Ecuador. The couple lives and works in Copenhagen, Denmark. Jenny Rose Tobin Jimenez, Arts ’02, and Alfredo Jimenez welcomed son Thomas Gerardo Tobin Jimenez on Sept. 20, 2017. He was 9 pounds, 5 ounces and 21.25 inches. 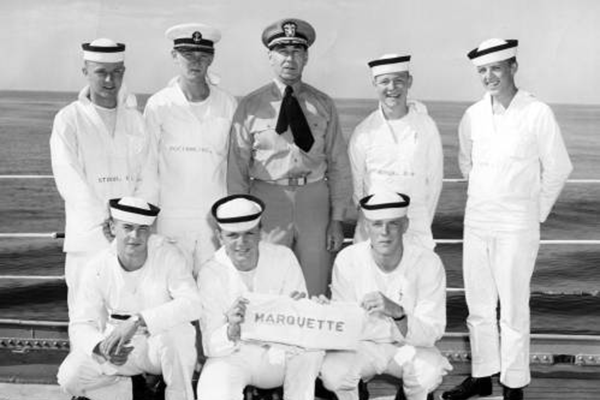 The family lives in Concord, Calif.
Marquette Navy ROTC midshipmen on a summer cruise.